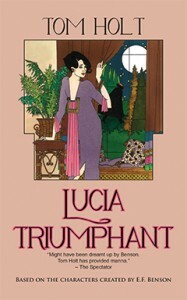 First published in 1986, Lucia Triumphant ($14.95, 262 pages, ISBN: 978-1-60381-126-2) is the second of Tom Holt’s officially sanctioned sequels to E.F. Benson’s beloved Lucia and Mapp series. Coffeetown released Lucia in Wartime in August. Lucia in Wartime and Lucia Triumphant can both be ordered wholesale by bookstores and libraries in the U.S., U.K., and Europe through Ingram. In postwar Britain, the quaint town of Tilling is feeling the pull of both the modern world and its Norman past. Elizabeth Mapp-Flint, in yet another bid to wrest power back from her social rival Lucia Pillson—now the town’s mayor—purchases a motor-car. Hoping to improve her shaky motoring skills in private, she makes a significant tactical error by leaving town. Lucia profits from Elizabeth’s absence by putting one of her “ideas” into action: the embroidery of a tapestry depicting the history of Tilling, one that will surely surpass Bayeux’s. All Lucia’s subjects are called upon to labour long and hard in its execution. Meanwhile Elizabeth, stranded in Southampton, happens upon a game of Monopoly in her hotel room, and—minus her broken-winged chariot—hurries home to rescue her fellow Tillingites from the tedium of Lucia’s latest worthy endeavor. Who will prove the greater master of Monopoly? What will become of the abandoned tapestry? Is Elizabeth really descended from Norman nobility? Is Mallards haunted, and if so, who saw the ghost first—Lucia, its current resident, or Elizabeth, its former owner? It is not in the best interests of the Tillingites to allow either woman to prevail for long. For in the end, Lucia and Elizabeth’s tactical maneuvering and petty victories and defeats offer the best entertainment in town. Tom Holt was born in 1961 in London, England. His first book, ‘Poems By Tom Holt’, was published when he was twelve years old. While he was still a student at Oxford he wrote two sequels to E F Benson’s Lucia series. After an undistinguished seven-year stint as a lawyer, he became a full-time writer in 1995 and has published over thirty novels. Tom lives with his wife and daughter in the west of England. As well as writing, he raises pigs and pedigree Dexter cattle. After a long and leisurely lunch had been eaten and properly digested, and coffee lingered over to an extent unusual even in Tilling, the Padre went sorrowing away for what he termed the afternoon shift, while Elizabeth sat and devised in her mind the overthrow of the Tapestry. She could declare a war of mockery and derision on the project and be sure that the oppressed workers would rise up and defect at her call. Yet to do so would be an overt act of hostility, and Lucia (so vindictive!) would blame her for the collapse of her precious hobby. A harder but better course of action would be to subvert it from within, smiling and smiling and being a villain, so to speak. And it so happened that she had within her luggage a secret weapon of unbounded potential, brought back from Southampton for just such a purpose. But now this mine could be exploded within the enemy’s citadel, rather than simply laid under her walls. She rose and went to the telephone. A number was demanded; she was put through. Foljambe’s voice answered at the other end. ‘Mrs. Mapp-Flint wishes to speak to Mrs. Pillson,’ she said, and soon Lucia’s voice, shrill and sharp as ever, came through the receiver. Lucia reassured her that there was plenty for her to do; only too delighted. Curiously enough, Lucia entirely failed to catch the significance of Elizabeth’s promise to run all the way (surely unnecessary for a motorist), for her mind, like Macbeth’s was full of scorpions. She knew only too well that her own declaration of peace had been Machiavellian policy. What else could Elizabeth’s gratuitous and unprovoked gesture of friendship be but another such? And, if so, what diabolical scheme had that dark intellect devised?